The innovative LS 2208 of handheld scanners from Symbol Technologies delivers performance features at an affordable price to make your buying decision easier than ever. Light weight combined with triggerless operation makes LS2208 easier to use and easier on the user. Extended working range reads symbols from contact to as far as five inches, making it ideal for automatic scanning. optimized laser beam for greater flexibility-including reading poor quality dot-matrix, high density(5.5 mil) adb wider symbols. For the fastest, easiest to use automatic triggerless scanners for all your close range scanning needs, the new LS2208 LaserTouch Scanner series from Symbol Technologies is the clear choice. Now you won't have to choose between price and performance: with the new LS2208 you get them both. With upgraded optics and triggerless operation, the LS2208 sets a new standard in reliable, comfortable, easy-to-use scanning in retail and light industrial environments. 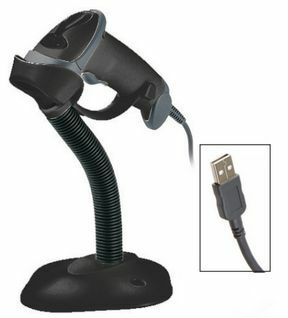 The LS2208 LaserTouch Scanner series can be hand-held or supported by a stand for hands free operation. Both triggerless and triggered versions are available to meet your specific requirements: Triggerless models are ideal for point-of-sale and workstation applications, while triggered versions conserve battery power for portable applications. The laser scanner can be programmed to decode the following code types: UPC/EAN, Code 39, Code 39 Full ASCII, Codabar, Interleaved 2 of 5, Code 128, Discrete 2 of 5 code type. Full autodiscrimination as required.